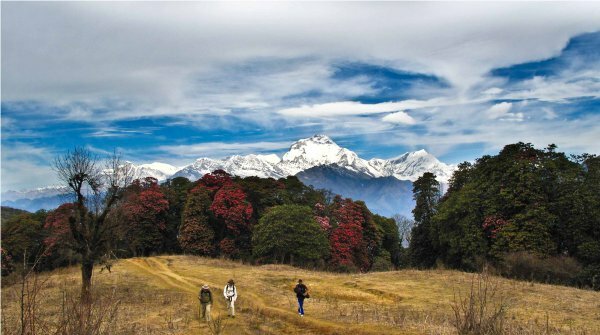 This Heritage & Nature adventures Tour gives you an ideal introduction to the delights of Nepal, with a variety of activities to experience many aspects of this magnificent country of Nepal. It includes everything that makes Nepal such a classic destination, including a trek through the Nagarkot Hills, and a rafting excursion on the Trishuli River with local guide . See beautifully preserved palaces and temples In Bhaktapur, and get an insight into the traditional Nepali life, as well as timeless mountain views in Kathmandu and Pokhara. Upon arrival in Kathmandu, and a meet and greet in the airport, transfer to your hotel for your overnight stay. Sunrise at about 06:00 for a transfer to the airport where you will board a small plane for a scenic flight over Mount Everest. See the top of the world in the easiest way possible, flying over the flora and fauna of the valleys and plateaus. Return to your hotel for breakfast, before a full-day sightseeing of the Boudhanath Stupa, Pashupatinath Temple and Bhaktapur City. Travel to Nepalguideinfo after breakfast. The journey is approximately 30 minutes, so relax and catch your breath before the start of a 2-hour hike to Changu Narayan, where you will get the chance to stroll, before driving back to Kathmandu for a sightseeing tour of Patan City, Kathmandu City and the Swayambhunath Stupa. Spend the night at a Kathmandu hotel. Journey from Kathmandu for approximately 2 to 3 hours to your river rafting start point at Charaudi. After a short briefing, hit the water and enjoy a few class 2 or 3 rapids called “Ladies Delight.” Stop for lunch and then continue rafting with more class 2 to 3 rapids called “Upset” and “Surprise.” Raft to Kuringhat. The total rafting time will be approximately 3.5 hours. Drive for about 3 to 4 hours to Pokhara for an overnight stay in a hotel. Enjoy a full-day sightseeing of the Pokhara Valley, with a 1-hour boat trip on Phewa Lake. In the late afternoon, you will fly back to Kathmandu for an overnight stay. Spend the morning at leisure until your departure time. Transfer to the airport to board your onward flight.